SteelSeries is celebrating a huge milestone of selling 10 MILLION MOUSEPADS worldwide to Gamers. 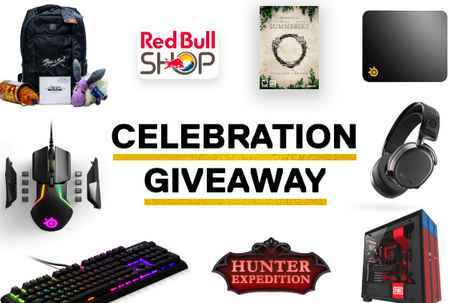 As part of the celebration they brings you the Steelseries 10 Million Mousepads Celebration Giveaway where they will be awarding tons of amazing prizes to 100+ lucky winners. How To Enter: During the sweepstakes period go to this link steelseries.com/10m and then Select your favorite SteelSeries products and you could win the whole setup! Browse their keyboards, headsets, mice, and mousepads to help decide your favorites! After you’ve told them your favorites, make sure to enter the giveaway. Good Luck.!! Who Can Enter: The Giveaway is open to worldwide only to legal residents of the United States and District of Columbia who are eighteen (18) years of age or older at the time they enter the sweepstakes. When To Enter: The Steelseries Giveaway entry begins on July 12, 2018 (the ‘Opening Date’) and ends at 23:59 CST on July 26, 2018. Who’s Sponsor: The Steelseries 10 Million Mousepads Celebration Giveaway is sponsored by SteelSeries N.A. Corp.